Developed in 1904, and featured on Colt's immensely popular M1911 semi-automatic pistol, the 45 ACP is a great caliber for self defense applications. Proven through years of military and law enforcement service, the 45 ACP is consistent and effective. With its phenomenal stopping power, you have just what you need to defend yourself and your family. Nosler has been the model other manufacturers compare their rounds to for years. With Nosler's exquisite design and fantastic performance, these rounds will preform when you need them to. 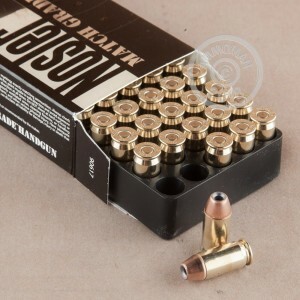 Each round in this box of 50 features a 185 grain jacketed hollow point projectile that delivers controlled expansion and consistent penetration. Nosler loads these rounds into fresh brass cases that are boxer primed and re-loadable. 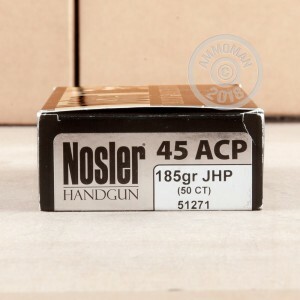 Pick up a few boxes of this premium 45 ACP ammo, or any other products totaling $99 or more and you will receive Free Shipping from AmmoMan.com!